Exercising is an integral part of our lives. We eat so much junk or get overly stressed with work that we need an outlet like exercising. When exercising, there are a couple of things we need. We need equipment, place, water, and of course, music. You can quickly acquire or rent the equipment. The place can be of your choice, may it be at the gym, studio, open space or your home. You need water to rehydrate, and music to pump you up your system. Having the perfect beat while performing push-ups or while running uphill makes anyone enjoy exercising more. And having water within reach can help you replenish the lost electrolytes in your body. You’d want to bring your water bottle, but it can’t easily fit your bag. Also, bringing a speaker with you just adds up weight in your bag. Well, there’s good news for all! Music device’s manufacturers have a found a solution to this problem. They have integrated wireless speakers in water bottles! We’ll offer you a list of some of the best water bottle wireless speakers. 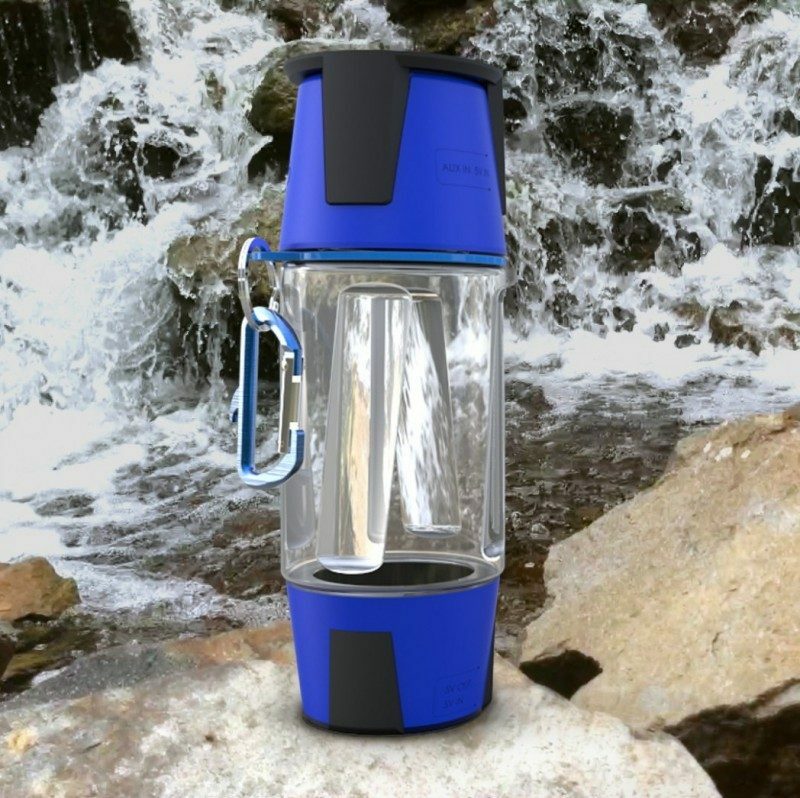 The company claims this wireless speaker to be the World’s Smartest Water Bottle. We might have the reasons to believe that they have a right to claim it. This speaker doesn’t only cater your music enjoyment but also water replenishment. You can stream music to it wirelessly from your smartphone, or tablet. It has an app that can fully control the speaker. You can also listen to music from your MicroSD card and can store up to 32GB of data. You’ll enjoy listening to music on this wireless speaker. They have built it with an audio quality that’s most advanced. This speaker is about providing you excellent acoustics. The Spritz can help you get in a better shape. Its water bottle speaker not only provide you with enough drinking water, but it can also remind you to drink enough liquid for your body. You can set the reminder according to your preference. 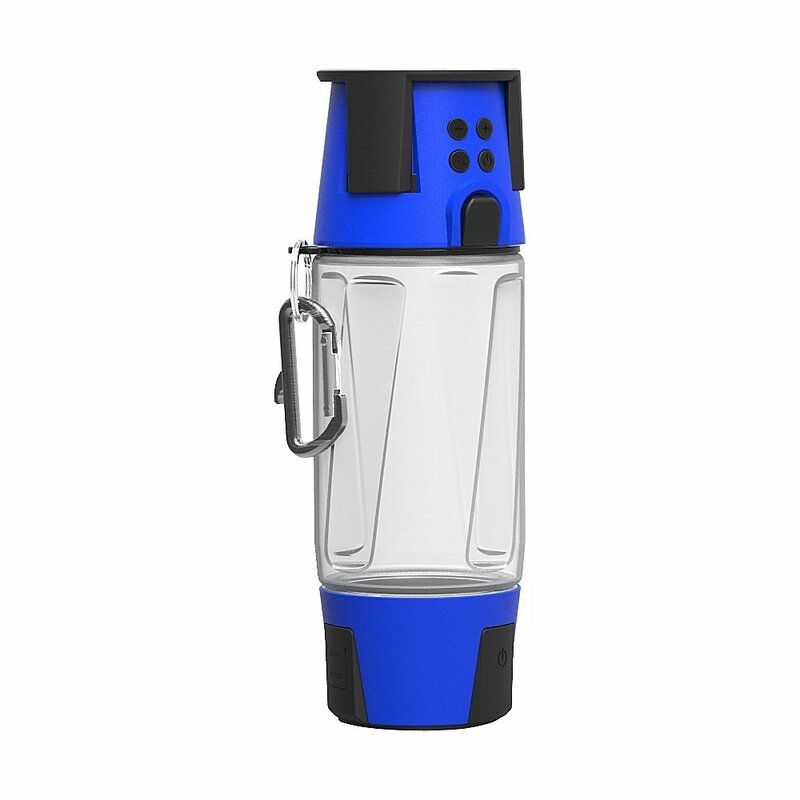 The Spritz Water Bottle Portable Speaker is waterproof with a rating of IPX4. It has a grip lock on top, allowing you to clip it to your bag or belt. The water bottle itself is BPA free, which makes it perfectly safe for carrying water. This wireless speaker can handle any activity that you’d go through with it. The 2-in1 Bluetooth Speaker with a BPA-Free Water Bottle is a water bottle sitting on top of a wireless speaker. They have rated the water bottle with an IPX4 rating. This Bluetooth speaker and water bottle have been made resilient against water damage. The water bottle can hold up to 12 ounces of water. It comes in different color schemes of red, green, and black. The colors available gives you the freedom to choose a water bottle according to your taste. The device can be paired up with any Bluetooth enabled device. You can play tracks from your microSD card if you don’t have your phone or tablet around. It can accommodate different audio files like WMA, WAV, and MP3. 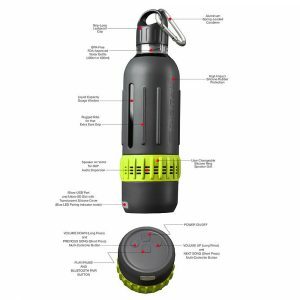 They have made the 2-in1 Bluetooth Speaker and a BPA-Free water bottle with a non-toxic copolyester BPA material. This wireless speaker weighs almost half a pound. The weight makes the device easy to carry around. Also, the battery life is pretty decent. You can quickly charge the device using a USB cable. 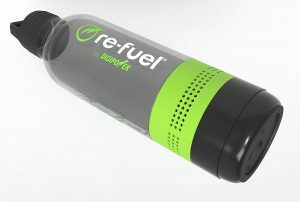 Re-fuel by Digipower has manufactured this wireless speaker. 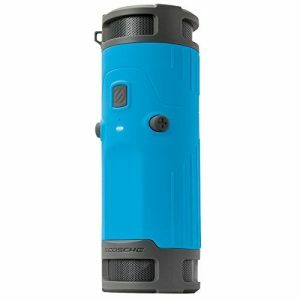 The Scosche BTBTLGY Boom Bottle wireless portable speaker is a wireless speaker that is weatherproof and rugged. You can easily fit it inside a water bottle cage or a cup holder. It can rest or stand on almost every surface. The speaker features a dual 40 mm omnidirectional driver. It also has a passive subwoofer that produces a clear and rich sound. The speaker has an IPX4 rating. It means that the speaker is well-protected from water splashes. You can play, pause or skip tracks on the speaker which makes it convenient. They have integrated the microphone within the speaker. The microphone allows you to make calls using the speaker. The 3.5mm auxiliary audio jack is available for playing tracks when you have no Bluetooth enabled devices available. It has a Lithium-Polymer battery that can give you 10 hours of playtime. The speaker comes in different colors. It’s available in gray, blue, black, yellow, and now, in fuchsia pink. It has a protective screen guard that can guard it against dust and debris. The dimension of this speaker is 4.8 x 4.5 x 9.6 inches, which makes it easy to carry. The design makes it an ideal water bottle and speaker for your exercise. What makes the Hydra Smart bottle perfect for you? Well, first, it can carry up to 600ml of liquid. The water bottle is BPA free and is FDA approved. You’ll be glad to know that the water bottle is detachable, letting you carry the speaker alone if you wish it. The speaker is water-resistant. It’s Bluetooth enabled, which can let you play music wirelessly. The speaker has a rubber base, which makes it easy to set on any surface. You can also opt to use the headphone jack if you wish not to use the Bluetooth connection. The speaker is rechargeable. You won’t need to replace the batteries since you can use the speaker using a micro USB connection. The speaker also has a 4000 mAh power bank. It has a flashlight too, which you can set in three ways. The speaker has a built-in microphone. It weighs about half a kilo which allows you to carry it around. You can mount the wireless speaker on your bike. Not only that, it has a secret compartment where you can stash in your valuables. 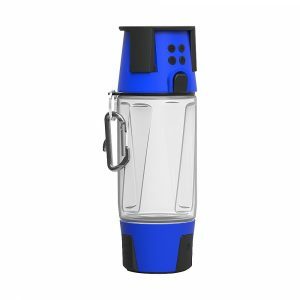 The Tectron 2-in-1 Portable Rechargeable Water Bottle + Wireless Bluetooth Speaker MP3 SD is a water bottle with a Bluetooth speaker. It’s great to bring it with you when you’re doing outdoor activities. 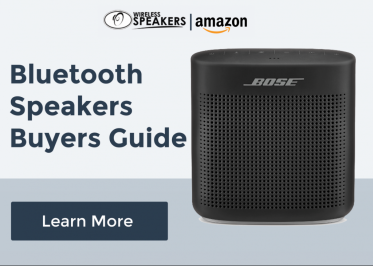 You can carry the speaker with you when you’re biking, hiking, camping, or fishing. This wireless speaker and water in one can bring replenishment and music with you wherever you go. 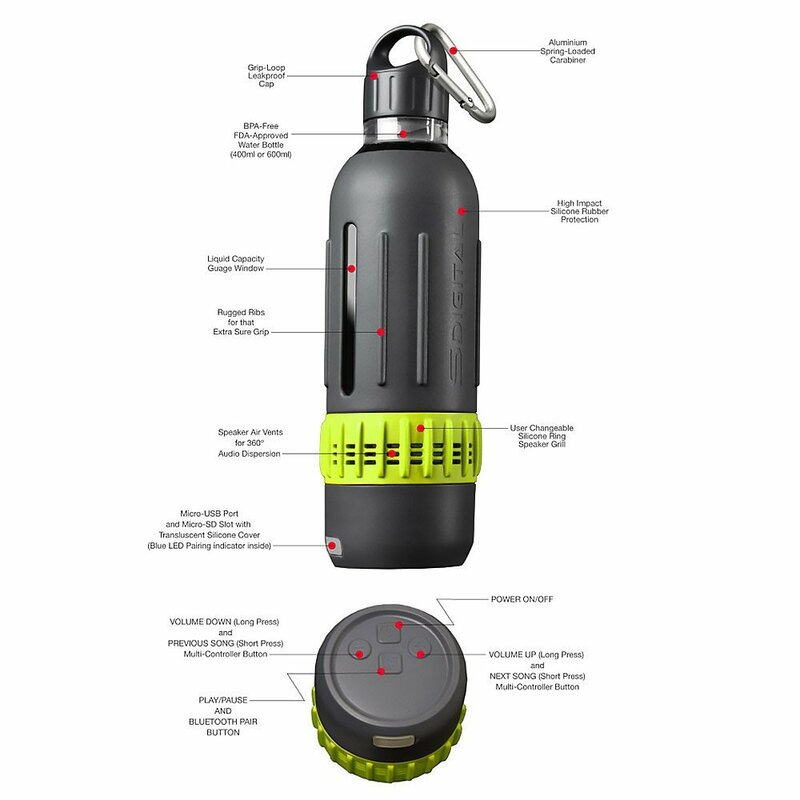 This water bottle with wireless speaker has an IPx4 water resistant rating. You can even bring this device with you while you’re running on a rainy day. It can store up to a 400ml of liquid. That might be enough to last you during your run. Best of all, the bottle is FDA certified and BPA free. It has 2.5w rated power. You can listen to your tracks with the 360 degrees surround stereo sound. It has a Class A large capacity lithium battery. The speaker also has a premium Bluetooth chipset and has two modes for playing tracks, Bluetooth mode and SD card mode. From now on, you won’t need to think of how bulky your bag would get. With these wireless speakers, you can carry your water bottle and speaker at the same time. 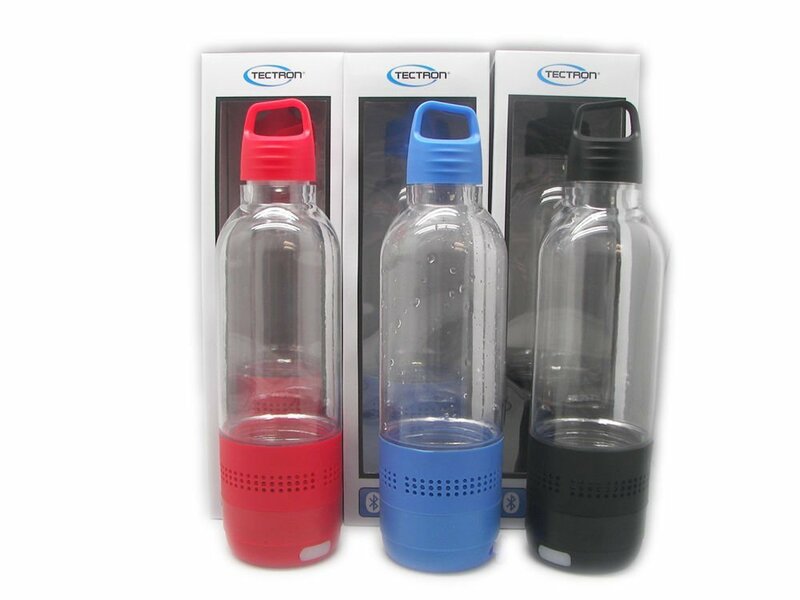 These products are best in the industry of water bottle shaped wireless speakers. They’re the best water bottle speakers.